Searching for a thermoset molder with large machine press capacity; a manufacturer of recreational vehicle (RV) kitchen and bathroom products inquired with us on a thermoset molding project for their bathroom and kitchen sinks. Due to the large part size, the sinks were injection-compression molded in a 500-ton thermoset injection-compression machine from a single cavity tool. With material properties requiring color, plus resistance to heat, steam, and corrosion; a thermoset polyester material – Bulk Molding Compound (BMC) 300 – was selected as a suitable material choice. Weighing roughly 510 grams, finished parts are deflashed before being shipped to a customer plant in Indiana. 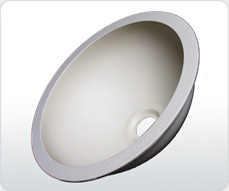 Product Description BMC molded Sink to be used within appliance application.